The Molescent Biax Series of fluorescent fixtures is created from a blend of lightweight polypropylene and aluminum. This Molescent houses 4 high output, 55w Biax fluorescent tubes, available separately, with on-board, dimmable flicker-free ballast, Phase Control dimming outlets and 2 power switches. Optional light shaping accessories, such as a louver, diffuser, filter frame and barndoor sets, are available separately. 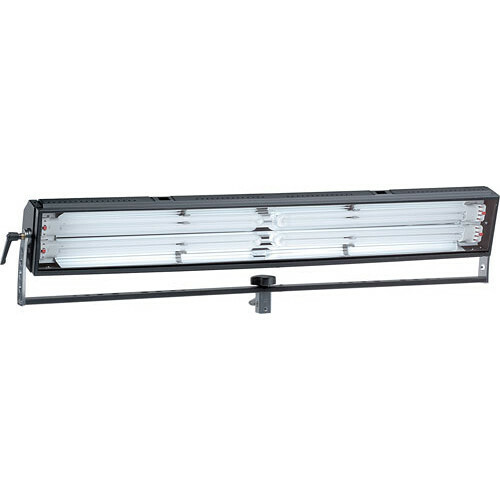 This is a 4- tube, 220 watt 46 inch long fluorescent fixture with yoke mount. It is suitable for lighting wide sets, where vertical space is limited. Phase control dimming models allow the fixtures to be controlled by existing SCR or triac dimming systems.